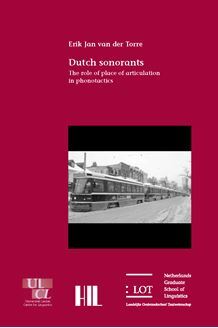 Couched in a theoretical framework which combines insights from Element Theory, Government Phonology and Optimality Theory, Dutch sonorants provides a detailed overview of the distribution and behaviour of the Dutch sonorant consonants. Although most theories of phonology treat the various sonorant classes (nasals, liquids and glides) as homogeneous groups, this dissertation illustrates that within each of these classes differences in distribution and behaviour can be observed, both in Dutch and cross-linguistically. These differences within the sonorant classes are accounted for by allowing place of articulation specifica­tions to play a crucial role in the licensing constraints that regulate syllabifi­cation. The influence of place of articulation on phonotactics is limited to the sonorant consonants of Dutch, because these segments combine consonantal and vocalic manner properties, while obstruents and vowels are defined by only consonantal and vocalic manner properties, respectively. In Dutch, syllabifica­tion is regulated primarily by manner specifications, but for segments whose manner properties combine both consonantal and vocalic properties, place of articulation plays a crucial role. Allowing phonotactic well-formedness constraints to refer to place of articulation makes it possible to explain, among other things, the defective behaviour of the Dutch /˜/, the difference between Dutch obstruent-lateral and obstruent-rhotic clusters in words like Teflon [PtEf.lOn ] ‘Teflon’ and zebra [Pze.bra ] ‘zebra’ and the liquid-like behaviour of the Dutch ‘glide’ /V /. This study is of interest to linguists concerned with the phonology of Dutch, the phonology of the Dutch sonorants and sonorants in general, and to linguists interested in issues of phonotactics.